Use SignalFx to monitor Azure Event Hubs via Microsoft Azure. Azure Event Hub: Shows metrics of an Event hub. Azure Event Hubs: Shows metrics of all Event hubs being monitored. Incoming vs Successful Requests - Charts shows a comparison of the total number of incoming requests and the ones that failed. Network I/O - Number of incoming and outgoing bytes to/from the event hub. Messages I/O - Number of incoming and outgoing messages to/from the event hub. Throttled Requests - Trend of the number requests throttled. Quota Exceeded Errors - Trend of the number errors due to exceeding quota. Server Errors - Trend of the number server errors. User Errors - Trend of the number user errors. Connections Opened - Number of connections opened. Incoming Requests - Shows the trend of incoming requests for all event hubs monitored. Successful Requests - Shows the trend of successful requests for all event hubs monitored. Top Event Hubs by Server Errors - List of event hubs with most number of server errors. Top Event Hubs by Quota Exceeded Errors - List of event hubs with most number of quota exceeded errors. Top Event Hubs by Users Errors - List of event hubs with most number of user errors. Total Network I/O - Number of incoming and outgoing bytes to/from all event hubs. Total Messages I/O - Number of incoming and outgoing messages to/from all event hubs. Connections Opened - Number of connections opened stacked by event hub. Throttled Requests - Number of requests throttled opened stacked by event hub. 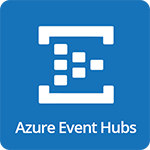 For more information about the metrics emitted by Azure Event Hubs, visit here.